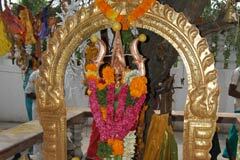 Aadi festival in July-August is grandly celebrated in the temple. Traditionally, Mother Mariamman appears in a sitting posture with left leg folded and the right hanging. It is vice-versa here. 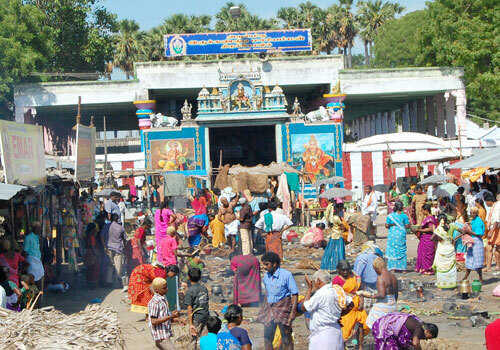 The temple is open from 6.00 a.m. to 1.30 p.m. and from 4.00 p.m. to 8.00 p.m.
Sri Irukkankudi Mari Amman temple, Irukkankudi, Sattur, Virudhunagar district. The belief among the devotees here that Aadi means Amman and Amman means Aadi and therefore Aadi Friday and Amman Friday make no difference to them. The darshan of Amman is always pleasant to their mind and soul. And if She is 1000 eyed Amman, the joy is boundless. Those suffering from impaired vision, stomach pain and other troubles, small pox, pain in hands and legs pray to Mari Amman for relief. 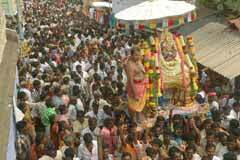 Mother Mariamman is between two rivers, Arjuna and Vaiparu praised equal to Holy Ganga. 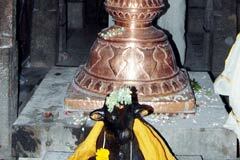 Hence, Amman is praised as Irukkankudi – between rivers – Mari Amman. The devotee thus gets the benefit of bathing in two Gangas. Arjuna springs from the Mahalinga Hills in Vatrairuppu. During their forest life, Pandavas were in this region, they came to the foot of this hill for a bath. But there was no water anywhere. Arjuna prayed to Mother Ganga and pierced the earth with his arrow from where sprang the Arjuna river. Pandavas had a pleasant bath. The river flowing on the south side is called Vaipparu. This also has a puranic story. A hunter, Sambugan by name performed severe penance standing in the midst of fire north of Shivashailam at the foot of Pothigai hills. This penance caused a death in Ayodhya when it was under Lord Rama’s rule. Angry Rama marched with His army and killed Sambugan. He restored the man to life who died in His land. (This event is described in the Utharakanda of Ramayana). Incurring the sin of killing Sambugan, Rama installed a Shivalinga in Shiva hills, worshipped Lord Shiva and got relieved of the sin. Lord Rama then reached the Western Ghats with his army. One Shambavan in the entourage told Rama that Sage Agasthya had hidden a pot in this place containing waters of all holy rivers. Rama was happy. He hit the hidden pot with an arrow from which a river sprang up. Vaippi means hidden. As the river flew from Vaipi, it is known as Vaipparu. Vaipparu flows through Karivalam Vandha Nallur, Sattur, Kollampatti and joins Arjuna river in Irukkankudi and flows further through Muthulapuram and Vilathikulam before reaching the ocean. This happened 300 years ago between Arjuna and Vaiparu rivers. 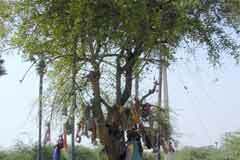 A priest – Poosari – woman filled her basket with the cow dung she gathered and was prepared to go home with the basket but could not lift it alone. She asked others to help her. They too could not lift the basket. She herself was influenced by the power of Goddess and exclaimed that Amman was under the ground where the basket was placed and ordered them to take Her out and build a temple. The villagers found the idol of Mother Amman, built the temple and are doing the pujas. Since then, She is the deity for the villagers taking care of their welfare. The sanctum sanctorum is under a beautiful vimana. 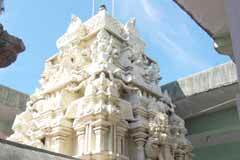 The Artha Mandap and Maha Mandap are close to the sanctum. Sri Nandeeswara and flag post-Kodimaram are in a line. Lord Vinayaka is under the Arasa Maram. On the west are Vazha Vandha Amman and Rakachi Amman. Pechi Amman and Muppidari Amman are in separate shrines on the northwest. Kathavarayan and Vairavamurthi are in the east. Karuppusami is in southeast corner. 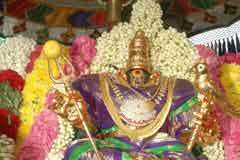 Devotees worship all these deities and Mariamman in order. Miracle Based: Traditionally, Mother Mariamman appears in a sitting posture with left leg folded and the right hanging. It is vice-versa here. 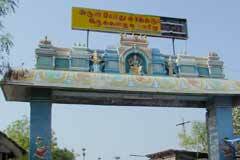 Irukkankudi is 8 km east of Sattur on the Tiruchendur road. 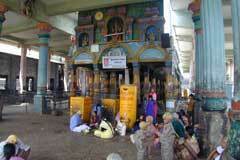 Town bus facility is conveniently available from Sattur to reach the temple.